Eliminate tomato blossom-end rot on your garden tomatoes with Bonide Rot-Stop Tomato Blossom-End Rot Ready to Use Spray. Blossom-end rot appears as a round, brown sunken area on the end of the tomato fruit opposite the stem and is caused by a calcium deficiency. This blight can also be aggravated by the application of too much nitrogen fertilizer to your plants, or a period of rapid growth followed by dry conditions. When used as directed, this ready to spray product helps correct the calcium deficiency and is effective as a supplement to a regular fertilization program for your tomato, cucumber, pepper, and melon plants. 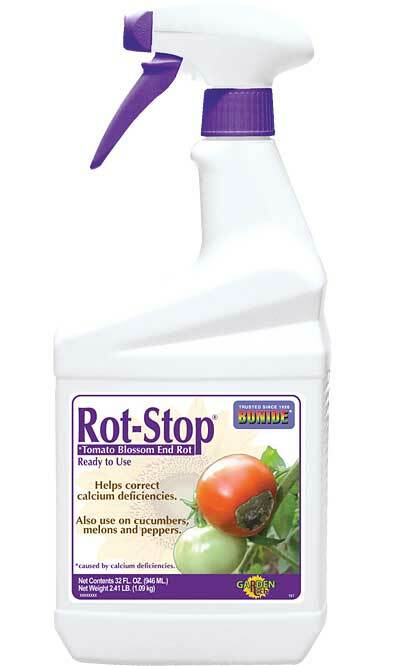 Control the blossom end-rot in your garden with Rot-Stop Tomato Blossom-End Rot Ready to Use Spray. Bonide Tomato & Vegetable 3-in-1 Spray, RTU, 32 oz.